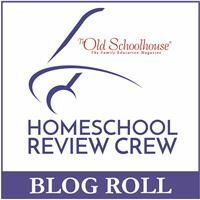 Home School Adventure Co. wants to inspire and equip parents to teach their children to be loving, compassionate, strong, and wise because they are fearfully and wonderfully made. Crew members were offered several items from Home School Adventure Co to review and we received Philosophy Adventure. 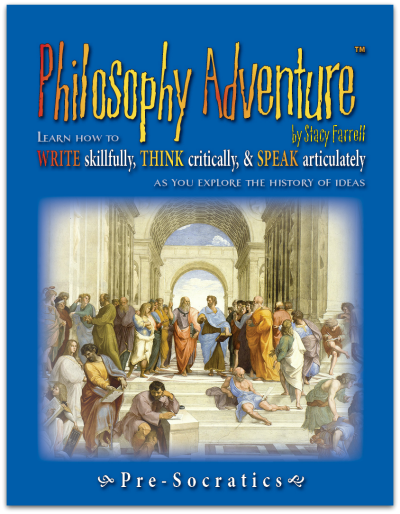 Philosophy Adventure is recommended for 6-12 grade students, and can be counted as high school credit. It will help your students cultivate and defend a biblical worldview by teaching them how to speak articulately, and write & think critically. I received the Pre-Socratics Reader, the Pre-Socratics Student Workbook, and the Pre-Socratics Teacher Resources as a PDF file. 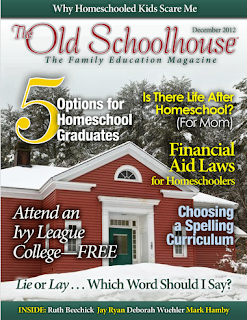 The digital download is available for $39.95 or you may purchase physical products or a combination of both. 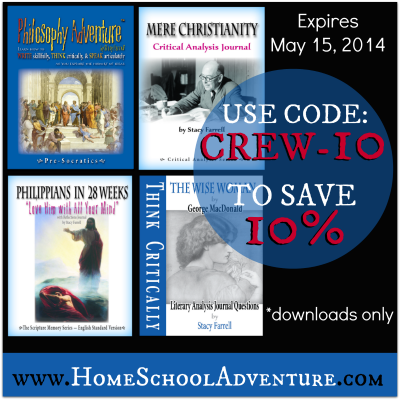 Philosophy Adventure is divided into 8 lessons that can be used in a 4 or 5 day school week. 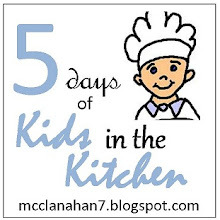 The same components are repeated in every lesson. The Pre-Socratics Reader is a 160 pages, and contains Philosopher stories, writing assignments & guidelines, thinking & memorizing, speaking, geography, cultural information, and contrast of a biblical worldview. In the back of the book are several lists and resources to help the student from pre-writing activities to a final evaluation on their writing. The Student Workbook is 143 pages. It contains information on each philosopher, maps, questions, journal pages, and a glossary for the student to fill in. This is an interactive PDF, so the student can fill in their answers directly on the computer or it may be printed. The Teacher Resources contains 110 pages. There are resources for vocabulary, memory cards that can be cut out, journal pages, philosopher notebook pages, timeline, master maps with keys, and quizzes. I have been using Philosophy Adventure with Amber (age 13). She is my child who has to hold the book, so we printed the student workbook and the teachers resources. We transferred the reader to our Kindle and read it from there. We have been working on this together, so we can have more discussions. I am a visual hands-on type of learner & I loved the time lines that are included, Amber on the other hand has this amazing timeline in her head & can mentally keep track of events. She loves the maps & the journal pages. We have both been learning a lot. Amber loves information & she loves to write, but sometimes her writing lacks proper order or could be a little more interesting and not so factual. By using the journal pages and the writing check lists she has started thinking about her writing before she just sits down and writes. She actually has some order going on & is starting to pay more attention to her audience. The stories of the philosophers are very interesting to read and some of them included things that have happened in more recent years that go with the story. We enjoyed the stories of each philosopher we wanted to skip ahead and just read the stories. The tips that are given to encourage memory, good writing and speaking skills are very helpful and are working for Amber. The questions in the reader & in the journal are mostly opinion questions with no right or wrong answer. I am a visual hands-on type of learner & I love the time lines that are included, Amber on the other hand has this amazing timeline in her head & can mentally keep track of people and events. She loves the maps & the journal pages.